It looks like Don't Breathe 2 is indeed happening and, quite importantly, Stephen Lang is involved. We first heard news of a sequel in late 2016, not long after the first Don't Breathe had finished cleaning up in a big way at the box office. Word has been pretty quiet ever since, but now, star Stephen Lang confirms that Don't Breathe 2 is happening. We still have a lot of questions, but this is potentially great news for horror fans. 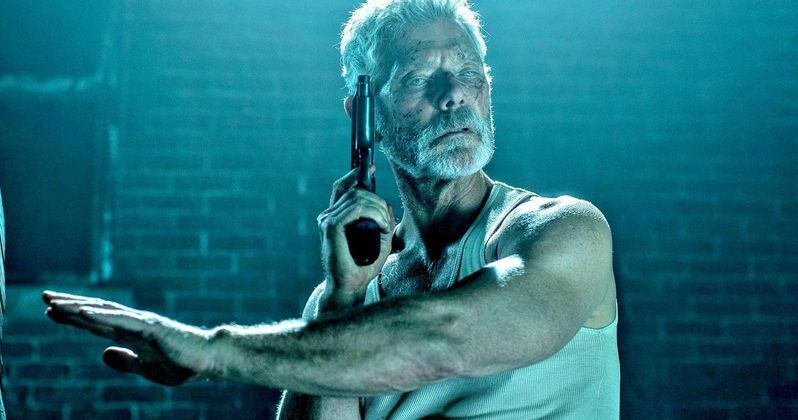 Stephen Lang is going to be busy filming James Cameron's four upcoming Avatar sequels, but it sounds like he's making room for Don't Breathe 2 in there somewhere. It still hasn't been revealed when the movie is happening, but director Fede Alvarez has been working on it and, according to Lang in a recent interview, he's confident it's happening. Here's what he had to say when asked about it. "Oh yeah, we're doing a sequel." Don't Breathe 2 doesn't currently have a plot synopsis or anything like that, and Fede Alvarez is being quiet on the details. For now. So it wasn't a guarantee that Stephen Lang's character from the first movie would return. Not that a sequel without him would make much sense, but this does, aside from confirming that the movie is indeed happening, also confirm Lang's involvement. Last year, Alvarez did talk a bit about Don't Breathe 2 and his initial hesitation to pursue it. "Right now, yeah, Don't Breathe 2 is something we definitely want to do. The challenge obviously is, we just don't want to do the same movie again, slap a '2' on it. We'll feel so embarrassed if we do that. Our first reaction when they told us, 'Do you want to do it?' was like, 'No, no, no, no, no, no, no, no. That's Hollywood! That's the devil! We don't want to make a sequel just because we can.' But then we got an idea that we're really excited about, and I won't tell you what it is because it will spoil the whole thing." Don't Breathe was quite the breath of fresh air, if you will, for the horror genre and it's great that the creative team isn't just moving ahead with a sequel for the sake of it. Sam Raimi, who serves as a producer on the first movie and the upcoming sequel, says "It's only the greatest idea for a sequel that I've ever heard! I'm not kidding!" That, coming from the man who made Evil Dead 2 and Spider-Man 2, should say something. The ending of the original Don't Breathe certainly left the door open for a sequel, but it also totally works as a complete experience on its own. However, from Sony's perspective, there's money to be made with another movie. Don't Breathe made $157.1 million worldwide from a budget of under $10 million. Not only that, but the movie did quite well critically, currently sitting at 87 percent on Rotten Tomatoes. As for when we could expect Don't Breathe 2? Fede Alvarez is currently working on The Girl in the Spider's Web and is also attached to the Labyrinth sequel. Stephen Lang couldn't shed any light on that during his interview with Screen Rant, but the movie is coming. Let's just hope it doesn't take too long to get going.